In the 5+ years that I have been examining the operations of NGOs in post-disaster reconstruction, there have been significant moves made to combat some of the issues that have been heavily criticised in the past- skill deficiency, cultural ignorance, resource 'stretch' mentality among others. 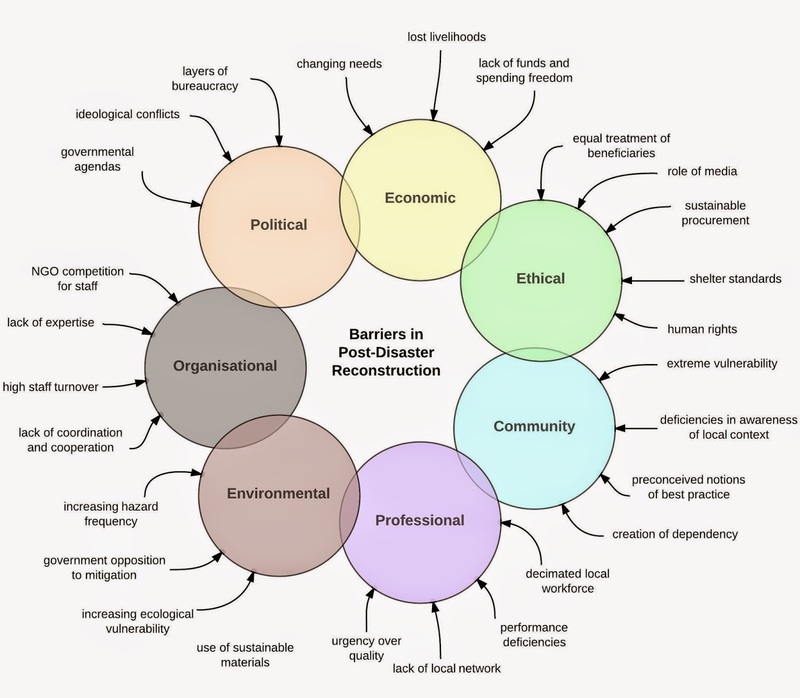 Some of the key outcomes of my work in Sri Lanka and Bangladesh have been to identify the key PDR barriers that NGOs face in seven key areas (see image below), and to provide evidence that organisations must deploy certain configurations of organisational and operational competencies in order to effectively develop and implement strategies to address these barriers. The research argues that the utilisation of these competencies, deployed in targeted clusters, has the potential to create positive outcomes for beneficiaries as measured by PDR Project Success Indicators (PDRPSIs). If dynamic tools can be developed that effectively model competency and predict success, all organisations involved in disaster response and recovery could benefit. In addition, the knowledge is highly transferable to other sectors and environments. If you are interested in the research, check out my new paper.